As their majesties Omega and Etheldreda drew close to the end of their reign they were suddenly called home to their Duchy to maintain their lands. As the heirs could not be summoned on such short notice, their Graces Darius and Etheldreda were left with no recourse but to leave the crown in the hands of the kingdom Seneschal, Mistress Mercedes. The Dread Crown Regent then closed the final court of the reign. She then opened the first court of her Regency. Crown Regent Mercedes then proceeded to lead the populace in a traditional Ostgardian sing along. 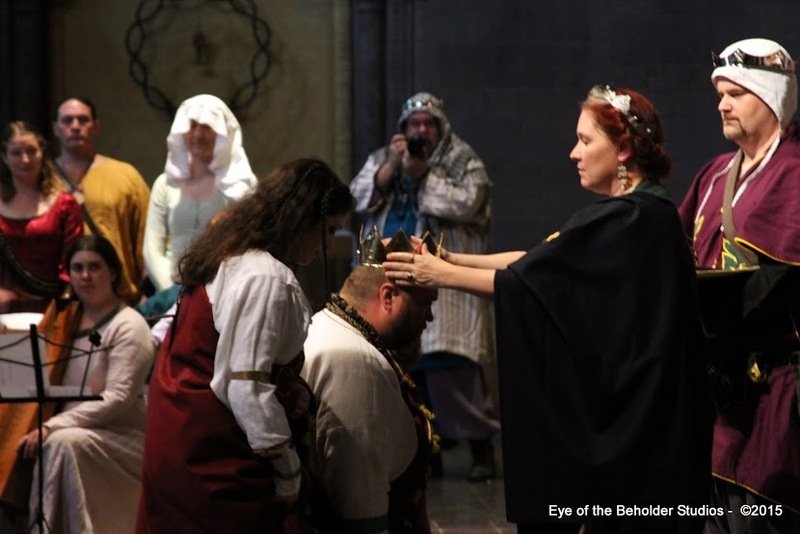 At the conclusion thereof she did summon forth and Coronate their Highnesses Brennan and Caoilfhionn as Brennan Rhi, and Caoilfhionn Banri, 96th King and Queen of the East, thus ending her Regency. So recorded and attested this day, the third of October, Anno Socitatus L.
– Master Ryan Man Whyte, Brigantia Herald of the Kingdom of the East.